Found 2 file extension associations related to Kamban Wordprocessor and 1 file format developed specifically for use with Kamban Wordprocessor. 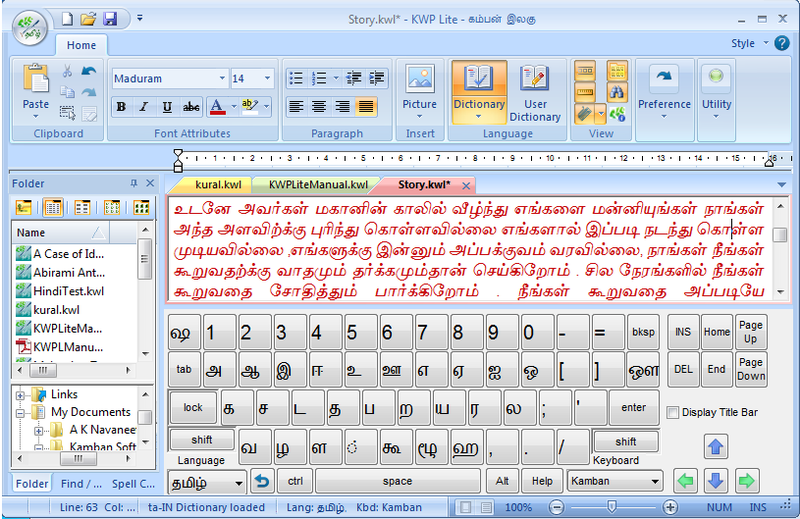 A Unicode complaint multi lingual word processor with multiple keyboard layout and dictionaries. KWPLite a full UNICODE complaint software and Supports 7 languages: English, Hindi, Tamil, Telugu, Kannada, Malayalam & Sinhalese. Additional 6 Tamil fonts when you purchase license. If you need more information please contact the developers of Kamban Wordprocessor (Kamban Software), or check out their product website.